Liberation Tigers recovered 5 dead bodies of Sri Lanka Army (SLA) soldiers as more than 300 SLA troopers who advanced into LTTE controlled area in Thampanai in Mannar (Mannaar) - Vavuniya border were repulsed after 10 hours of heavy fighting in the area, LTTE's Military Spokesman Irasiah Ilanthirayan told media in Ki'linochchi. The Tigers have also seized military equipments. Military sources in Colombo remained tight-lipped on Mannar offensive. Heavy fighting has ensued in the area from 6:00 a.m. till 4:00 p.m., according to the Tigers. At a separate location in Vavuniya Mannaar border, a group of SLA soldiers on a assault mission in Naavatku'lam in Vavuniya Mannaar border, were attacked by the Tigers. Three civilians were injured when shells fired by SLA Sunday morning between 11:00 a.m. and 12:00 noon fell and exploded in the villages, Periya Pa'ndivirichchaan, Chinna Pa'ndivirichchaan, Periya Thampanai and Keerichuddaan in Mannaar District. The victims have been identified as Theresamma Croos, 59, Maryro Lambert, 25 and Edward Alestin, 17, all from Periya Pa'ndivirichchaan. 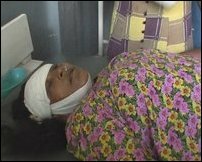 The injured were admitted at Mannar church medical center for treatment. 06.05.07 Tigers repulse Sri Lankan offensive in Mannar, rec..